A New Description of Carolina engraved by Francis Lamb, London, 1676. Image from Wikipedia. 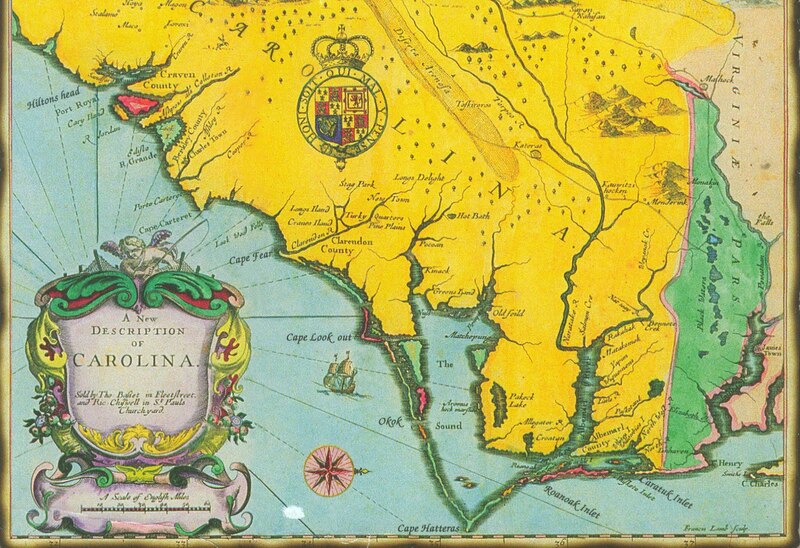 Thomas Pinney writes that the first two colonies in what is now North Carolina, known as the Province of Carolina until 1712, did not appear to produce any wine. In what is now South Carolina there was hope for the production of wine in the 1670s but again no documentation that anything was produced. In 1680 the first organized group of Huguenots landed in South Carolina with one of their goals to produce wine. In 1682 both Thomas Ashe and Samuel Wilson give accounts of wine being made in the Carolinas. Pinney goes on to write that in 1683 the Huguenot Frances de Rousserie was awarded a grant of 800 acres due to his attempts at propagating wine in Carolina. Early attempts at further winemaking appear to end with Sir Nathaniel Johnson who arrived in 1690 and went on to plant a considerable vineyard. 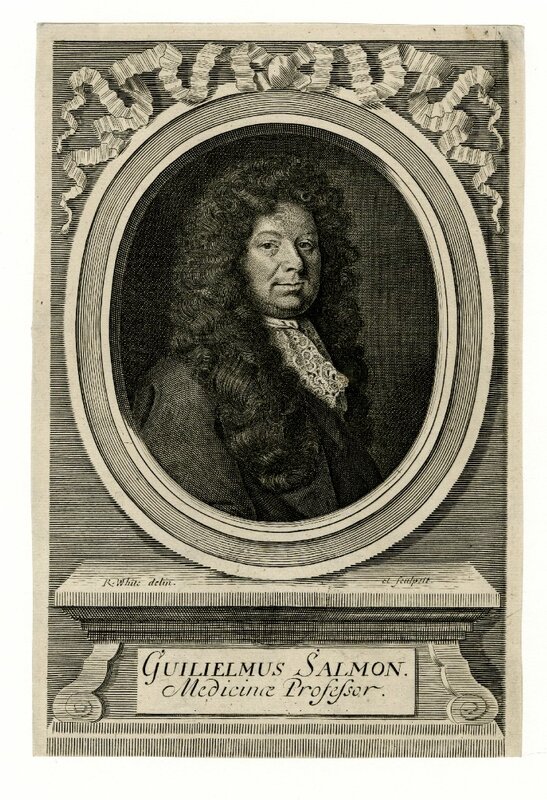 William Salmon (1644-1713) was a medical empiric self-published author who is famous, in part, for having written the first description of the tomato in the British colonies. William Salmon left England in 1687 for the colonies where he traveled throughout New England, Virginia, Carolina, and the Caribbean. He returned to England in 1690. In 1710 he published the first of two folios of his major work Botanologia: The English Herbal, or History of Plants. There are many references to plants he observed throughout his travels but most interesting is his description of Carolina wine in Chapter DCCXXIV Of the VINE. This wine would have been tasted in 1687-1690 or five to eight years after the first two descriptions. These two descriptions are part of the earliest tasting notes of wine produced in the British Colony of Carolina. I must admit they do sound tasty. ‘America and West Indies: November 1700, 26-30’, Calendar of State Papers Colonial, America and West Indies, Volume 18: 1700 (1910), pp. 664-706. URL: http://www.british-history.ac.uk/report.aspx?compid=71379&strquery=carolina wine Date accessed: 10 June 2013. Oxford Dictionary of National Biography. URL: http://www.oxforddnb.com/view/article/24559 Date accessed: 10 June 2013. Pinney, Thomas. A History of Wine in American: from beginnings to prohibition. Volume 1. University of California Press, Berkeley, 1989. Salmon, William. Botanologia: The English Herbal or, History of Plants. I. Dawks, London, 1710. Smith, Andrew F. The Tomato in America. University of South Carolina Press, 1994. Moore, Norman. Life of William Salmon, 1897.